CES 2009: Will this lovely set be the death of OLEDs? 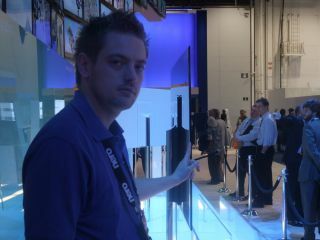 Samsung's failure to bring any sort of new OLED TV to CES 2009 was somewhat tempered by the new ultra thin, LED backlit, LCD TVs. The performance of these models was more than adequate, pumping HD into your eyeballs with aplomb... but we all know that's not the reason for dreaming of getting your hands on one of the units - it's the insane thinness. We couldn't get an accurate reading on the actual depth of the TV, but have a look of the picture - it's around 10mm (TechRadar doesn't have thick fingers or anything). With the super-thin wall mount released by Samsung as well, pushing the TV even closer into the wall. However, the bad news is that these aren't going to be released any time soon, though Samsung intimated that it's likely these stupidly thin sets will be the big news next year. The word on the underground is that Samsung is slightly worried about the technical limitations of OLED technology... the manufacturing problems are still prevalent and getting them down in price is something that's still a long way off. So is the future of super-thin television likely to be through LCD after all? It seems if Samsung can make these sets work, then OLEDs might be in real trouble.